It’s pleasant to see publisher and poets staying loyal to each other, especially in these austere times. Many poetry publishers are struggling for grants, closing their lists or shutting down completely. These two fine collections, both from publisher John Lucas’ Shoestring Press, benefit from attractive, distinctive productions, both with accomplished poets on their fourth or fifth collections with the press. 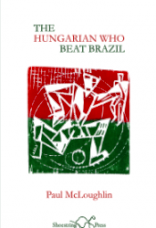 The Hungarian Who Beat Brazil is Paul McLoughlin’s fifth poetry collection; his fourth with Shoestring Press. It is seven years since McLoughlin’s last collection in 2010, The Road to Murreigh, except for an appearance in Wood & Ink (also with Shoestring Press, 2013) where McLoughlin, along with five other poets, responded to the wood cuts of Alan Dixon. Born in London of Irish parents, retired from even part-time teaching in 2012, McLoughlin writes poems, writes about poetry, wears great hats and sometimes plays jazz saxophone and flute. like a human hovercraft, you said. This poem demonstrates McLoughlin’s dexterity with language and resonance; his alliteration of ‘g’,‘h’,’’f’,’m’,’r’ and ‘b’ sounds mirroring the footballer’s flair. McLoughlin has a light droll touch with the second subject of the poem, namely Albert’s skill which was “one thing we agreed on,/ recovering from another Sunday row/ when silence was the aftermath/ and balls were neither here nor there”. still sells tat. There’s no escaping that. her kidneys are not functioning efficiently. 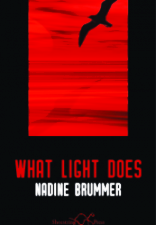 What Light Does is Nadine Brummer’s fourth collection of poetry. She was born and brought up in Manchester, read Classics and Philosophy at the Universities of Oxford and London, then taught Latin, worked as a psychiatric social worker with children and families, and was a Lecturer in Applied Social Studies at Goldsmiths College, where issues of race and culture were some of her central concerns. Shoestring Press published a chapbook by her (A Question of Blue Tulips, 1998). Her first full collection, Half Way to Madrid (2002), also with Shoestring Press, was a Poetry Book Society Recommendation. Out of the Blue was published in 2006 and Any Particular Day in 2013.
of selves that aren’t ours. Brummer seems to be contending that the natural world is beyond our understanding: “Who really knows how oceans work?” (‘Abalone Glose’). The second section shifts into wider register of observations, with the same strong eye, but here Brummer is more challenging of commonly held beliefs. At a Quartet at Beaminster Festival, Brummer craves: “more primitive sounds made/ by men contriving dance as a tool/ to survive dark times – ..” Brummer now interacts with nature, she names and talks to the birds, even if people think she is “going doo-lally” (‘Grosbec’). She wants to see what the birds see, hear what they hear. This is the world she values: “.. year by year I’ve found/ small galaxies in woods/ when February unearths/ its first white flowers” (‘Not Crying For the Moon’). Reflections on her culture, including in childhood, emerge in this section including on Kol Nidrei and Gaza. slow down our perception ..
a place where people jump. Here, as elsewhere, Brummer shows her skill at description and celebration, and her ability to delve what lies beneath.